Do you need something easy and yummy to make tonight for dinner? Well if you're into peanuts, this is just the thing! Heat pot to medium heat and add 2 cups water. Add chicken and sprinkle with salt. Stir thoroughly until chicken is cooked. Drain and set aside. Meanwhile, in large skillet, combine sugar, peanut butter, soy sauce, water, cooking oil, and garlic. Do not add coconut milk yet. Heat over medium heat until bubbling, stirring occasionally, then reduce heat to medium low. Once peanut butter and sugar has melted completely, slowly add coconut milk, stirring until dark sauce has become caramel colored. Let sauce simmer over low heat to thicken. Steam cook spinach leaves in a small skillet heat the sesame oil over medium heat. Add the broccoli and chicken to the oil and sauté until the broccoli is slightly cooked. 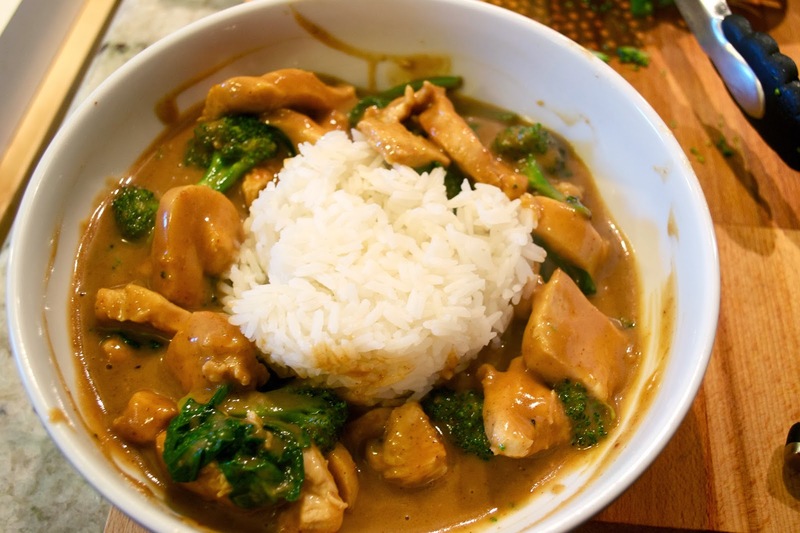 Stir the spinach chicken and broccoli into the peanut sauce and pour sauce over rice. Serve hot and enjoy!